Baddie – Malfunctioning military equipment. Seriously, these things never. work. Lesson – Stop GMOs, especially in the form of carnivorous hybrids. Rounding out this week’s SciFriday-Trifecta-Triumphant-Return we have Sharktopus vs. Pteracuda. Guys, I love Roger Corman, and I didn’t hate Sharktopus, and Roger Corman personally assured me on Twitter that this would be a good time. Plus Conan O’Brien is in it, so, go Coco! As you may or may not remember, Sharktopus died last time, so naturally we begin our film with a tiny little Sharktopus emerging from an egg sac. It’s kind of adorable. And, since we have to have a Pteracuda, we do indeed have a Pteracuda! It’s intended to replace fighter jets. The theme of these movies is “Military Malfunction”, so naturally it stops listening, and off goes one intern’s head. I’ll admit that the design of Pteracuda is actually pretty neat looking and a bit less…awkward than that of Sharktopus. It can swim because of the barracuda part, so that makes it a tiny bit cooler actually. I…I might be rooting for Pteracuda. In the meantime, baby Sharktopus has been raised in an aquarium by an ambitious trainer, who is actually doing….a great job. I guess they’re trying to Godzilla this, where Sharktopus can be educated, and trained, and therefore expected to help it’s new human friends. 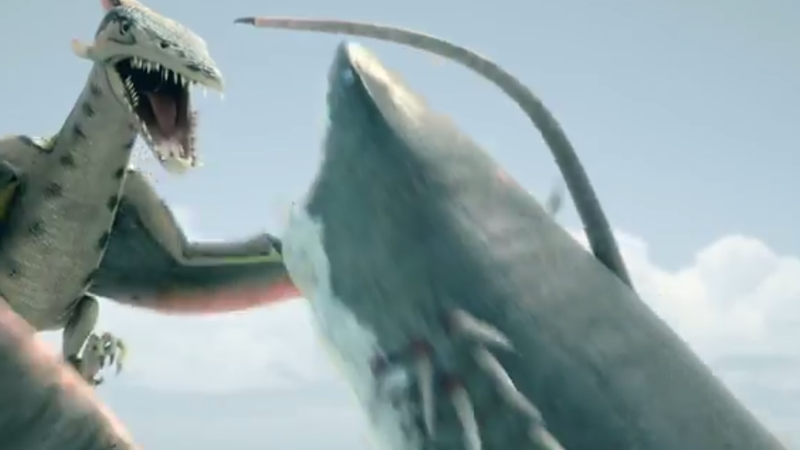 Sharktopus vs. Pteracuda starts off kind of strong. I laughed once even. And then it just slowly, slowly, slowly…tanked. The plot grew slower, the pace grew slower, the deaths got slower, and it just, died slowly. I stopped caring, the charaters stopped caring, and even the ‘rampage’ of the two monsters stopped being a thing. 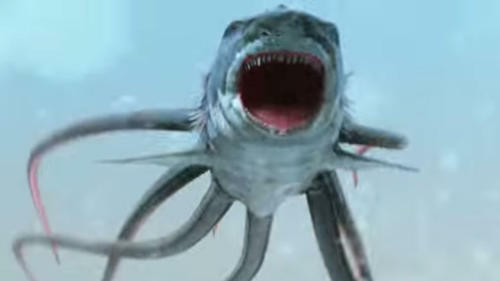 Sharktopus does what he’s the best at, which is lazily swimming around and slaughtering people. Pteracuda followed suit with a bit more ambition, all the time forgetting that they were supposed to be fighting each other. Camerawork was lazy, CGI was plentiful (just like the first movie) and also either lazy or under-budget. At some point it becomes two lively bathtub toys fighting each other and I’m bored. 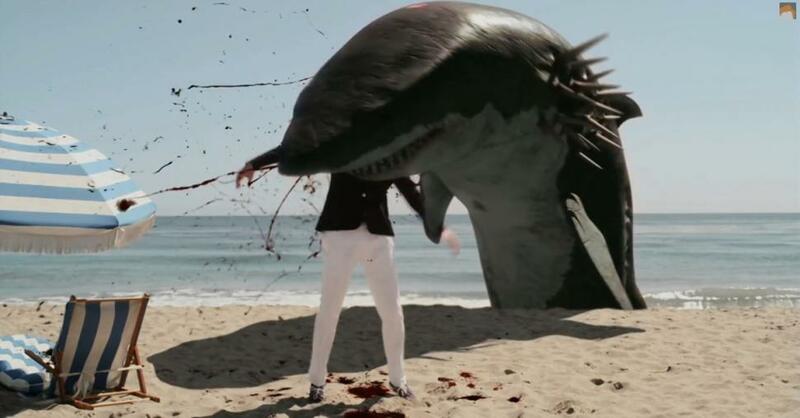 The most disappointing cameo of the year goes to Conan O’Brien, sadly, who’s on screen just long enough to be an insulting rich creep (not convincingly because he’s stupid charming and I love him) and then get stabbed and beheaded by Sharktopus. Then people play volleyball with his head, because, y’know. The close up features a terrible wig. I…I don’t know. The mad scientist in this movie, however, is played by Roger Carradine, also known as Lizzie McGuire’s dad. So that was kinda fun. Everyone else’s acting skills could have probably used like, gosh, I don’t know. An ounce of emotion? Or maybe a speech coach? The dialogue is as awkwardly paced as the plot. I mean, the plot is boring, but with a little bit of nudging it could have been a lot more exciting. If you’re interested in a slow, doddering plod towards death and infinite boredom, by all means, check out Sharktopus vs. Pteracuda. I should mention that I’m watching it by myself with some takeout, so it might be more fun in a group, these movies usually are. I’m sad to say that it was disappointing, and I know it’s because SyFy has gotten super lazy. Stop making movies featuring dumb things for the sake of dumb. It’s really insulting to the viewer, and I have to keep reviewing them and I hate it.